Having sick little ones is no fun! It’s even worse when you are up all night trying to take care of them but you’re exhausted. Now that we have kids, it seems like we can’t go a week without at least one person getting sick. Fevers are so bad because they can escalate quickly. Now there’s something parents can use to have peace of mind all night long! This post is sponsored by Fever Scout. I received a complimentary product to facilitate my review. As always, all thoughts are my own and I choose to only share things we actually use and like! Inside your package, you’ll get: the Fever Scout wearable patch, charging dock (with storage compartment), 3 AAA batteries, 8 removable patch stickies, and an instructional booklet. When you unbox your Fever Scout kit, open the compartment on the underside and insert the 3 batteries. Next, place your Fever Scout on the dock to charge it. Then, grab your smart phone and download the FREE app. You can get it here for Android and here for iPhone. It will ask you to create an account. This is so you can receive and share your personal data (temperature tracking, medication, etc.). The sharing feature is awesome because you can share info with your significant other or even a babysitter/grandparent/etc. if someone else is caring for your little one! It’s a small device and both the Fever Scout patch and dock unit fit right into the palm of your hand. Once you download your free Fever Scout app and get your new account set up, you’ll want to activate your patch and pair your unit with your phone. What’s so cool is that the patch sits on the screen of your phone to get connected! It takes about a minute or so and is so easy! It shows you exactly where to place your patch and then you just watch the magic happen! Once your patch is paired, it’s ready to use! Next, you will attach one of the 8 included adhesive patches. There is a hole cutout in the adhesive sticker that goes on the little circle sensor on the Fever Scout patch. It also shows one side for baby and one side for the fever patch so you know you’ll put it on correctly! Once you have the adhesive attached to your Fever Scout patch, you will place it on the side of your child’s chest on their right side with the purple end pointing toward their armpit. (See photo below.) Your phone will go through “Warming Up” which will tell you that it’s about 8 minutes. It took about that long for us so that’s pretty accurate. Keep in mind, you will have to keep your Fever Patch dock near your child in order to the temperature data to transmit to your smartphone. As long as the charging dock is near the patch, the Bluetooth can extend up to 100 feet. This range will differ based on location of the patch on the body and surrounding environment that may interfere with the Bluetooth (BLE 4.1) signal. After the warming up session completes, you’ll see your child’s temperature displayed on your phone! This screen also indicates how much of a charge your patch has as well as the Bluetooth connection. Did I mention the Fever Patch is rechargeable?! Totally awesome! The two buttons at the bottom of this screen show your temperature chart (so you can track if the fever is going down, if the medication is working, etc.) and a share button (so you can send data from the app to someone else). Above you can see the graph view screen in the app where it tracks your child’s temperatures by the hour. You can see the red dotted line going across. That’s the alert threshold that I set. You can actually set the alert threshold to any temperature that you want (see below)! I just did 101.5 for the purpose of this review since Aidan does not currently have a fever and I don’t need to track him right now. Why should Moms use the Fever Scout? The big feature of this wearable device is that it tracks continuous temperatures and provides parents with real-time monitoring. That means that as you lay in your bed, you can grab your phone and have instant peace of mind knowing what your child’s temperature is throughout the night. If your child’s temperature raises above whatever threshold you set, your phone will immediate receive an alert, even when it’s in sleep mode, so you know to go check on your child and administer more meds or otherwise treat his or her fever. If you’re like me, you’ll be checking on your child either way, but it’s so nice to know that if their fever spikes up while I’m asleep I will know immediately! Remote tracking is also available and you can turn it on or off. Is the Fever Scout Patch/Bluetooth Safe? The materials on the patches are biocompatible, lead-free, and BPA-free. The Fever Scout uses a radio technology called Bluetooth Low Energy (BLE). The SAR (Specific Absorption Rate) value is around .001 watts/kg, which is less than 1/1000th of the SAR limit for cell phones set by the FDA and FCC. Bluetooth emits much lower levels of radio frequency than smartphones or other Wi-Fi-based devices – the risk is negligible. My husband and I love technology. We also love our children (duh). Being able to use technology to take even better care of our children when they are sick is so important to us! I love how easy this device is to use and that my kids are comfortable with it! We tried the patch on Aidan and it didn’t bother him at all. What I liked even more was that it didn’t hurt when we took it off! I was worried about that after having some not so great IV experiences of my own last year. It stays on well and I seriously love being able to view info in real time. I love that I can have peace of mind that I’ll get an alert should anything change while I’m asleep. It’s also great to have a chart to track if the medication is actually working! 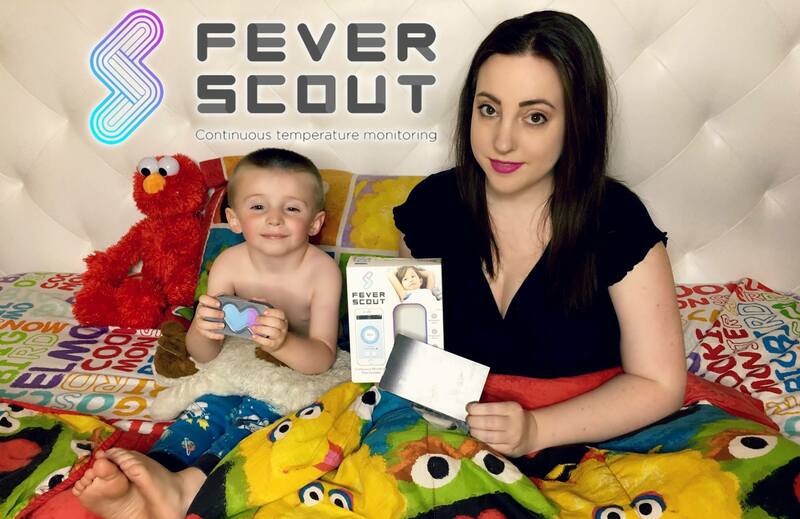 And although I’ve used other types of thermometers, my kids don’t always love having things poking them or running across their forehead when they are sleepy so with Fever Scout, they can just relax and focus on trying to rest without me bugging them! It is so awesome that there is new technology available these days to help monitor babies and children, keep them safe, and keep parents alert of anything that may go wrong while we sleep. I think the Fever Scout is a great tool for parents and definitely recommend it! I know that once cold and flu season returns, we’ll be getting a lot of use from this awesome product! It’s also pretty soft and it’s made using my two favorite colors, teal and purple! Even my 5 year old said the colors look beautiful. He has great taste! You can get your own Fever Scout kit at www.feverscout.com for $59.99 + FREE shipping! OR, Get it on Amazon HERE. Head over to the Fever Scout website to learn more about how it works! Be sure to follow Fever Scout on Instagram, Facebook, and Twitter! What do YOU think about wearable tech for your family’s health?